Stencilled around the outside of the case is ‘ROUND A RIOT 1.5IN BATON LR L3A1’: This then indicates that this is an Anti-riot round, the bore diameter is 1.5 inches and that it is a long range baton round. 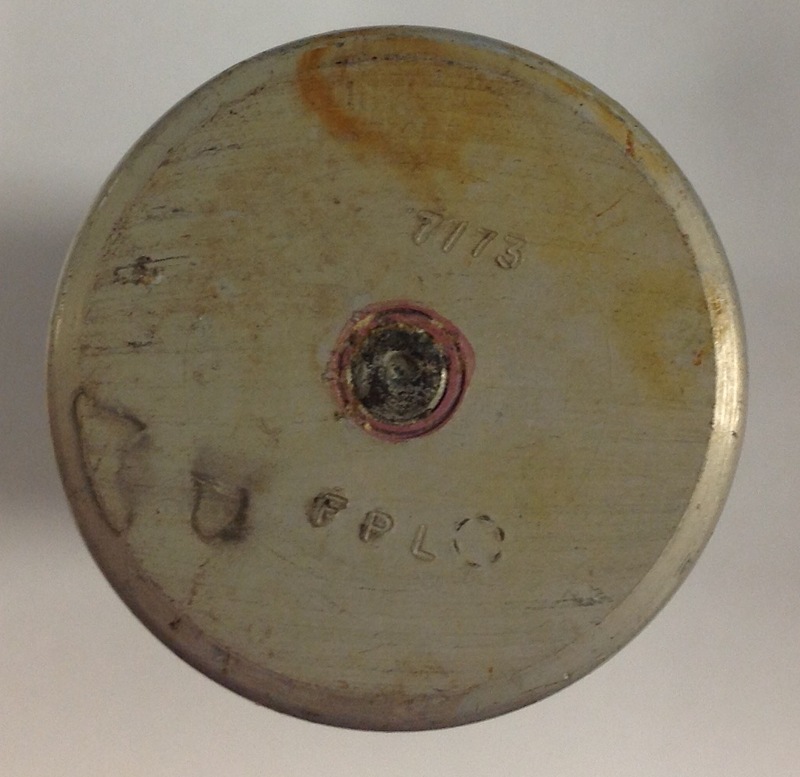 A second marking indicates that the round was assembled in January 1973: The case itself was manufactured in October 1972, as indicated on the base: 56,000 of these rounds were fired by 1975 and the instructions were for it to be fired at the ground so it ricocheted up into the target as it could cause serious injury and indeed fatalities if fired directly at a person. A safer plastic baton round was introduced in 1972 and slowly replaced this round over the next few years although a small number of fatalities have still arisen. During the troubles 17 people were killed by rubber and plastic baton rounds. Considering that 125,000 of the rounds had been fired that works out to a death rate of 0.0136% so they were a comparatively safe way of dealing with a rioting crowd, especially if used correctly and aimed at the abdomen and legs where they caused great pain but little risk of death, rounds striking the chest or head had the capacity to be fatal and training emphasised how soldiers and police could use the rounds most safely. This entry was posted in British Army, Northern Ireland, Ordnance, Post WW2 on July 30, 2018 by hatchfive. There are a number of reasons why military equipment can be found in mint unissued condition. Sometimes items are produced in such large quantities that there are plenty available for the surplus and collectors market that have never been issued. Other times a piece of equipment is just not fit for purpose and after initial issue to the troops is swiftly abandoned and large quantities sit in warehouses until sold in the secondary market. Finally there is the most unusual set of circumstances where a piece of kit is a good idea, well made and would be welcomed by troops but through administrative blunder is never used and tonight’s object tells this tale. I seem to remember resting my SLR on my right-side 58 pouch, though you had to wear the belt loose and without the yoke to achieve a comfortable fit………………never, ever saw one of these pouches in service. Unfortunately no-one at a unit level knew they existed and so they were not ordered from stores for issue and instead languished in a warehouse until flooding the surplus market. At this point the market was saturated and despite attempts by some dealers to market them as hexamine cooker pouches (they do fit in but it is purely by chance), huge quantities were burnt as being essentially unsellable. This has now led to a situation where they are nowhere near as common as they once were and for the collector of post war webbing and equipment it is worth picking an example up as a testament to official bungling! 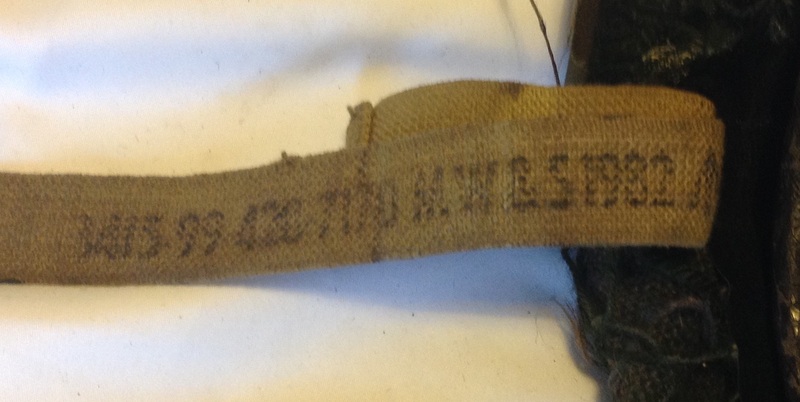 This entry was posted in British Army, equipment, Northern Ireland, Post WW2, Webbing on November 4, 2017 by hatchfive. First tour 75 country Tyrone, dress was boots dms with puttees, trousers lightweight, kf shirt, woolly pully, combat jacket with yellow card in breast pocket, green waterproof, sometimes a parka, beret and blacked out badge. Belt order with ammo pouches and water bottle only, although it was a bit of a waste as we only had 20 rounds. So lots of room for sweets and choccies. This entry was posted in 58-Webbing, British Army, Northern Ireland, Post WW2, Uncategorized on July 10, 2017 by hatchfive. for it to blow the wrong way and end up in old people’s houses. 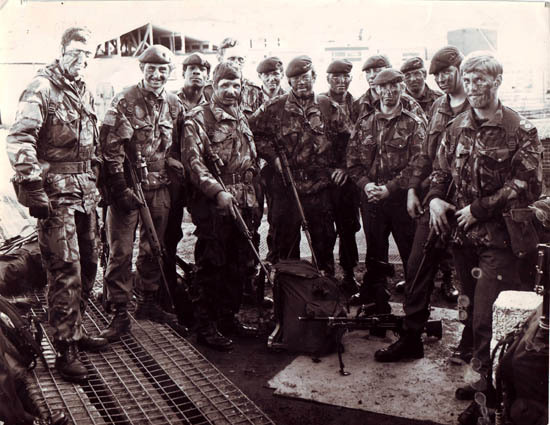 Despite the decision to stop using it in Northern Ireland, munitions and training continued in case it was needed at a future date. This entry was posted in British Army, Northern Ireland, Ordnance, Post WW2 on September 12, 2016 by hatchfive. 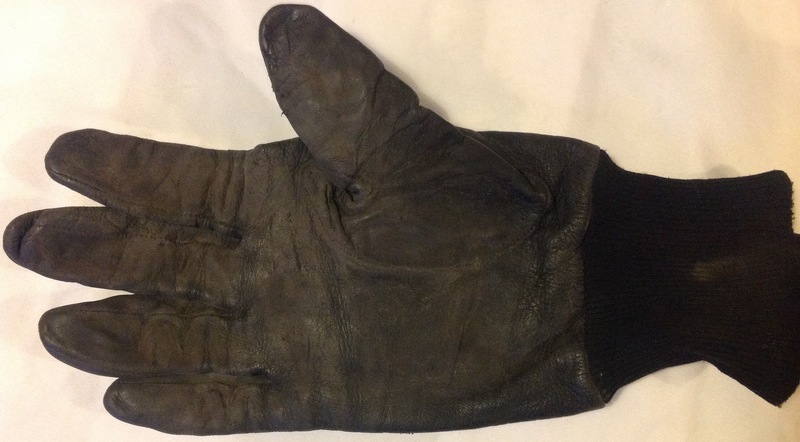 In the 1960s The British Army issued a pair of woollen gloves to troops deployed to Northern Ireland for warmth and protection. 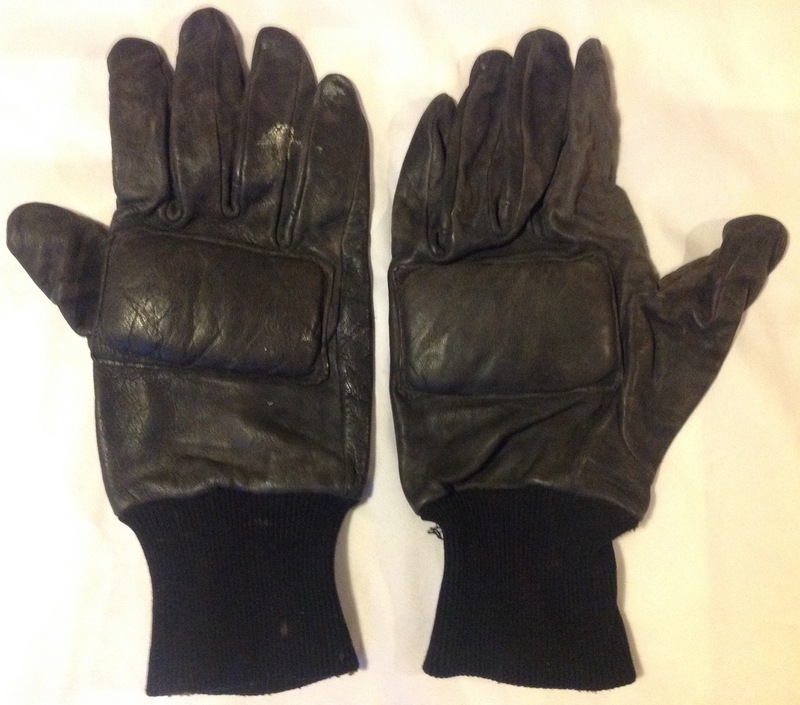 These were clearly unsuitable, with troops substituting motorcycle gloves and other padded civilian types. 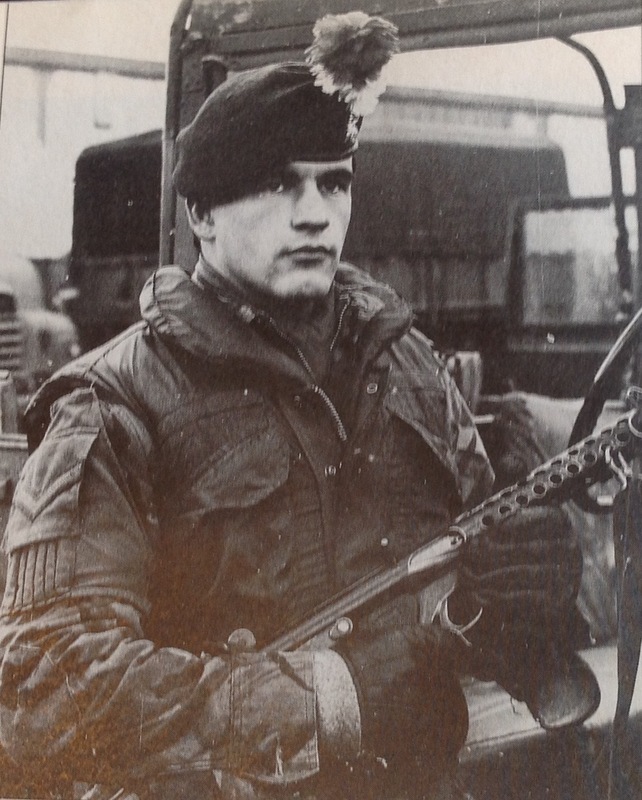 In this photograph of a soldier patrolling on the streets of Belfast in 1972, these early civilian gloves can easily be seen: New gloves were introduced between 1974-76 and were designed for use in an urban environment, being made of black leather: The earliest pairs had padded fingers as well as knuckles, this pair is more modern and have had the finger padding deleted; just the knuckle padding retained: The padding was designed to help protect knuckles when the wearer was handling riot shields and batons and in an urban environment with hard surfaces all around. 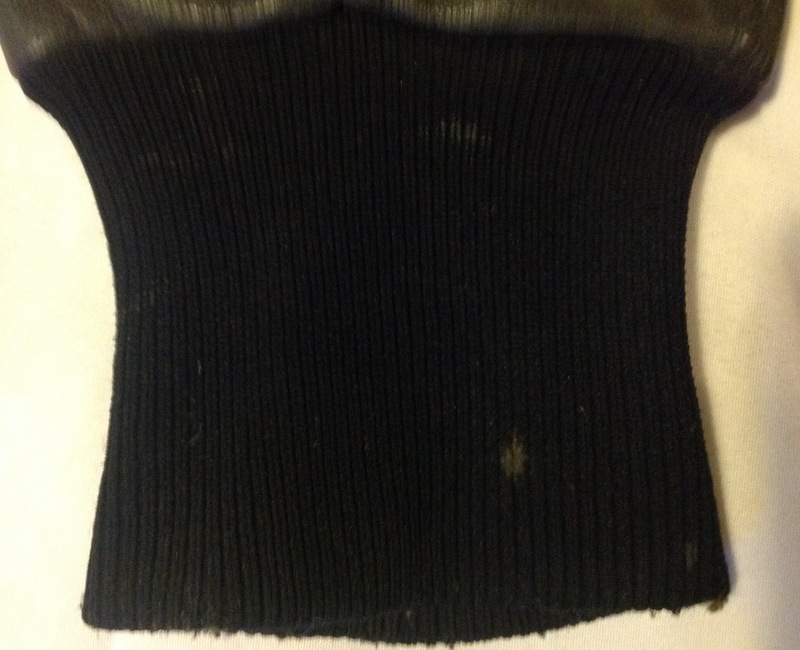 It was also rumoured that the padding allowed soldiers to get physical with protestors without leaving a mark. 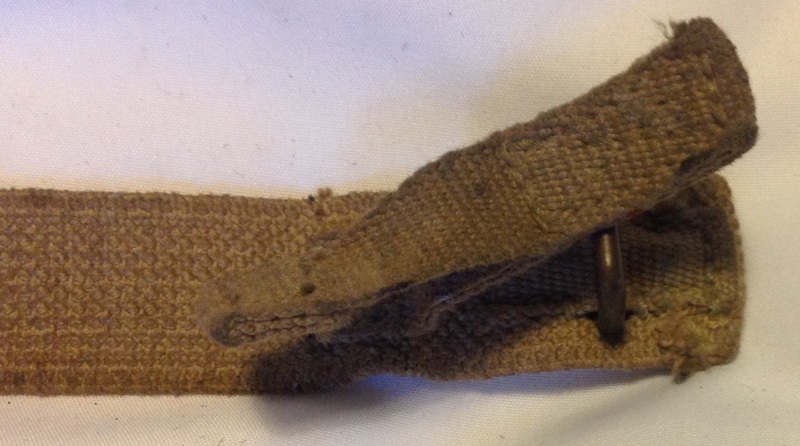 Having spoken to one old soldier who served in Operation Banner, it was not unknown for the stitching on the padding to be undone and a piece of lead or a bag of sand inserted into the knuckle area to create an improvised knuckle duster- the lead being quietly removed afterwards to ensure there was no come back for breaking rules of engagement! This entry was posted in British Army, equipment, Northern Ireland, Post WW2 on May 13, 2016 by hatchfive. 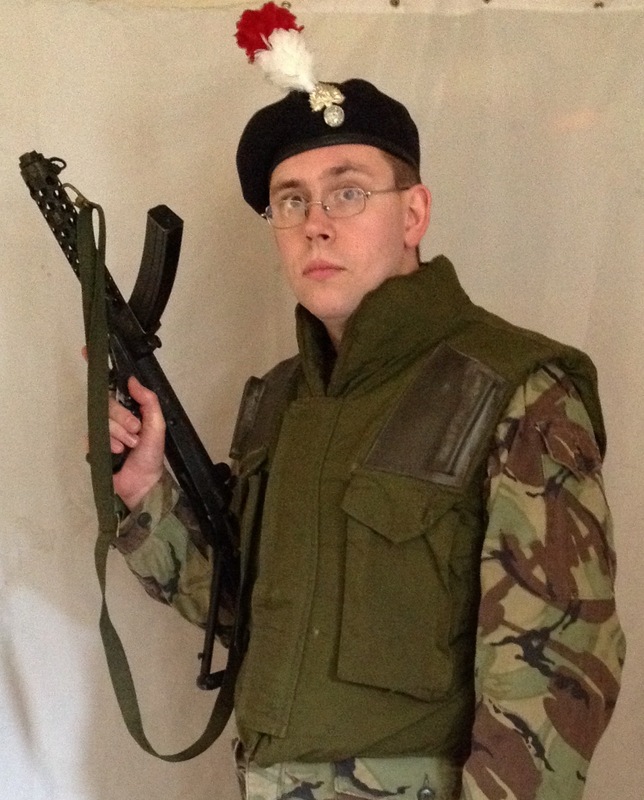 There are many distinctive items of uniform in the British Army, with regiments jealously guarding their historic symbols as a sign of their identity and comradeship. One of the most distinctive of these is the white and red hackle of the Royal Regiment of Fusiliers: The hackle is a plume of clipped feathers in a distinctive colour, worn on the headdress of particular regiments and most have a long history and commemorate a battle or campaign from the past. 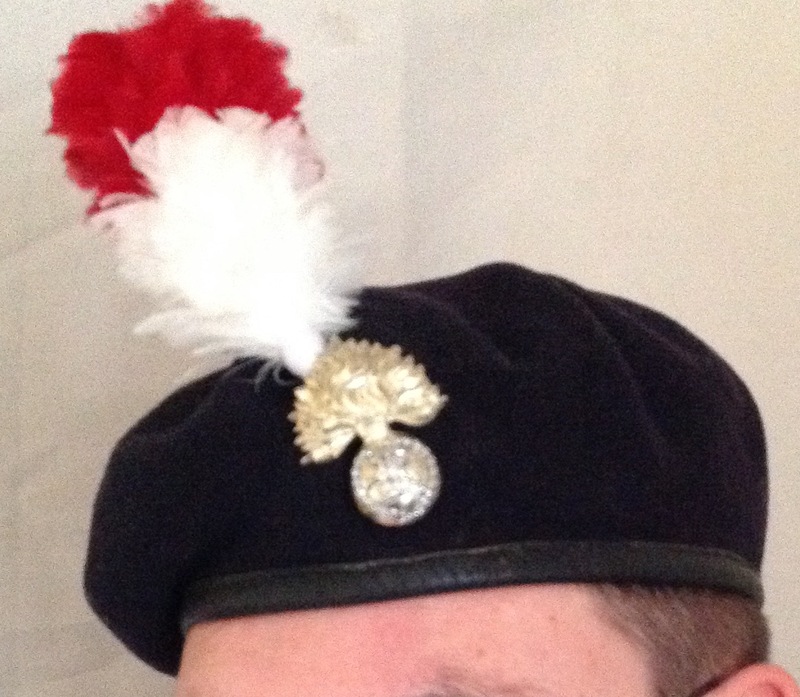 The Royal Regiment of Fusiliers inherited its distinctive hackle form one of its antecedents, the Royal Northumberland Fusiliers. In 1778 the 5th Fusiliers had successfully thwarted a French attempt on St Lucia and took the white plumes form the enemy and wore them in their caps as a special distinction for the next 51 years. Then, with white plumes long having been authorised for grenadier companies, they were given permission to wear a white plume tipped in red to perpetuate their hard won privilege. This entry was posted in British Army, Insignia, Northern Ireland, Post WW2 on April 17, 2016 by hatchfive. Whilst the British Army in the Cold War used standard infantry helmets for its infantry, certain specialist troops used their own designs. A rimless helmet was introduced, with different chin straps depending on whether they were for airborne or armoured use. The shape of the old ‘soup bowl’ Mk II helmet was unsuited for wear in a tank due to the limited space and chance of catching it on things, a more compact rimless helmet helped alleviate this problem, whilst still giving the tank crews some protection to their heads. Armoured troops continued using the rimless helmet shell introduced during the Second World War, modifying it to bring it into line with the requirements of warfare in the 1980s. 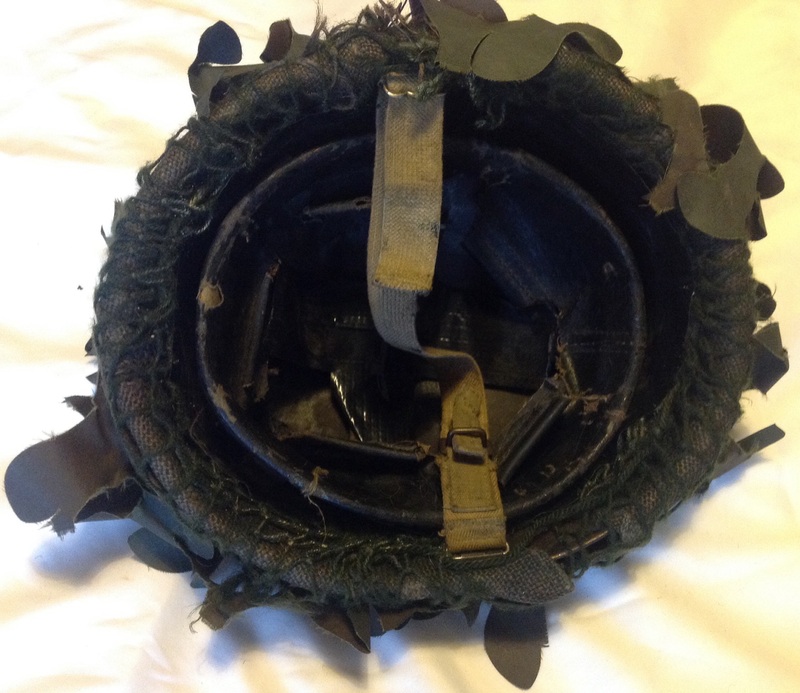 Tonight’s object is an Armoured Corps Mk II Steel Helmet first introduced in April 1945, however this example dates from the early 1980s: The helmet consists of a manganese steel shell, with a rubber liner inside: As can be seen the top pad is missing and has been replaced by gaffer tape. 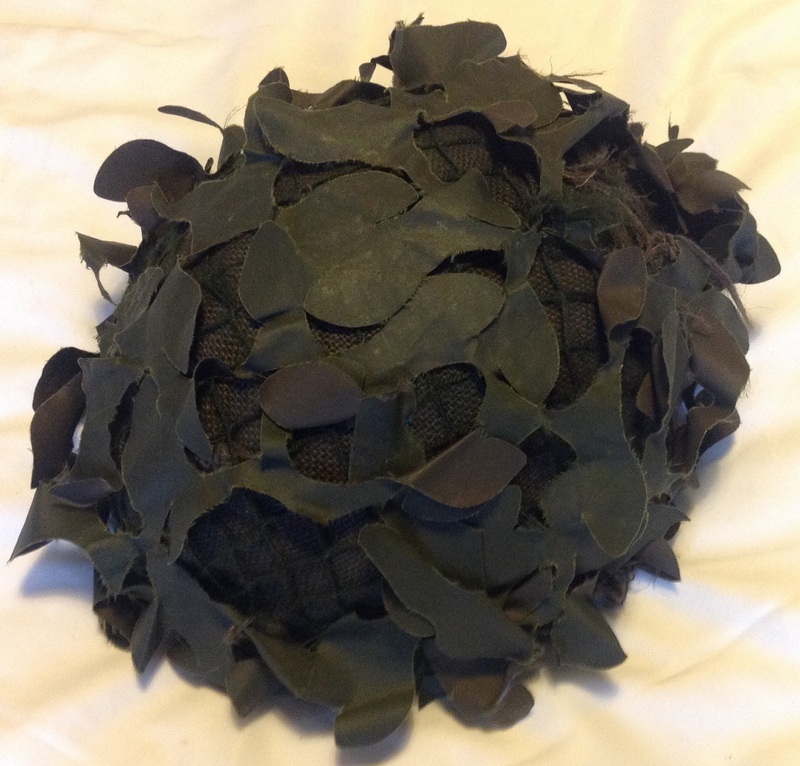 The helmet is covered in typical scrim of the period: The base layer is hessian sand bagging material, overlaid with a camouflage net and finally with plastic ‘foliage’ on top of that. 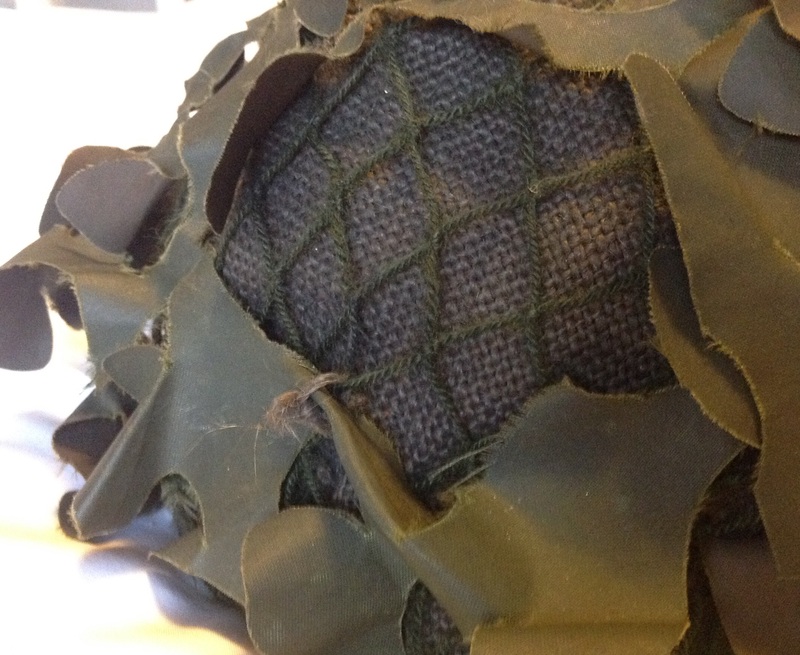 The sandbagging prevents any shine appearing from the helmet shell under the rest of the scrim. The plastic scrim is very characteristic of the cold war as it was dropped soon after as it had the unfortunate habit of melting or catching fire! The chin strap for the helmet is the MkIII version, with a quick release fastener consisting of a tongue and staple: The helmet strap also has a NATO stores code, manufacturer and date of 1983 printed on it: Use of this design of helmet was not restricted to land based troops, the helmet was also issued to Royal Navy ships for wear by sailors, though obviously these helmets don’t have the scrim! Many of these helmets have been bought by re-enactors to convert into WW2 Parachutist helmets (apparently its not easy to drill through the steel to add the alternative chin straps though), but I particularly like mine for the straight out of service look it has. 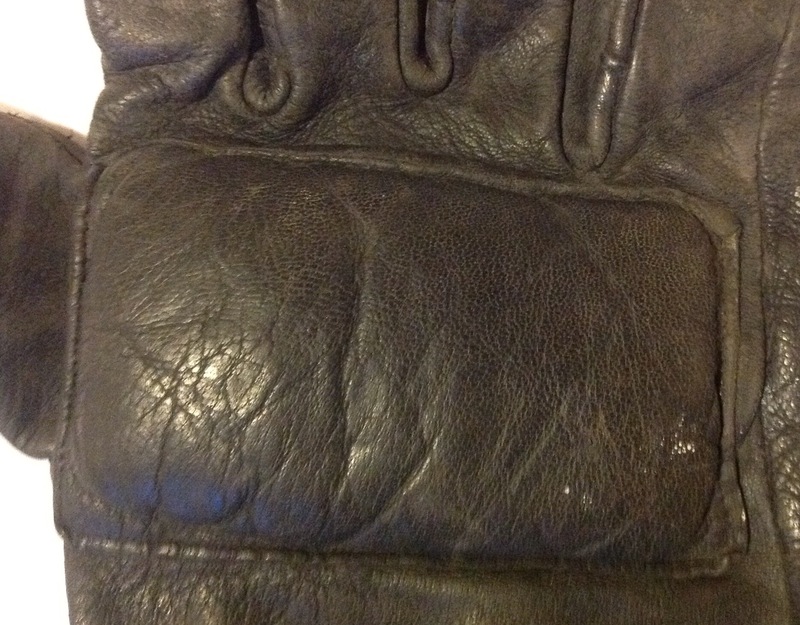 This entry was posted in Headress, Northern Ireland, Post WW2 on December 22, 2014 by hatchfive.